Great news! Over last few months I've made great progress on TotalFinder. 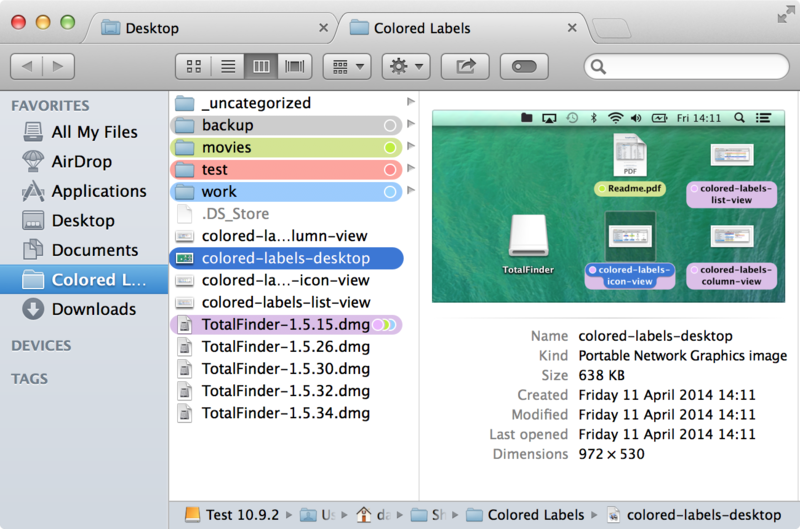 Today I'm happy to announce TotalFinder 1.6 with Colored Labels. We all remember color labels from Mountain Lion, right? In Mavericks the labels were replaced with tags represented by smaller colored dots. Under Mavericks you can now apply multiple tags to selected items. In effect it is not clear what color should win, so Apple decided not to paint row backgrounds colors at all. TotalFinder 1.6 offers you an option to render full-row color background using the color of the last tag applied to an item. If you keep this rule in mind, you can use tags in a way which emulates color labels in older OS versions. The implementation is solid and I'm really happy about the final outcome. Read more in the documentation. I did a lot of work on TotalFinder code base. It is now more flexible. It always has been a challenge to keep TotalFinder updated with system changes, but now I believe I will be able to react to Finder changes in new OS X more rapidly. At this point I'm also officially dropping support for OS X 10.7. The last supported Lion version is 1.5.38.